Working with architectural imagery throughout her career, Cheryl Goldsleger has explored seemingly simple formal compositional elements in her work since the mid 1990s. 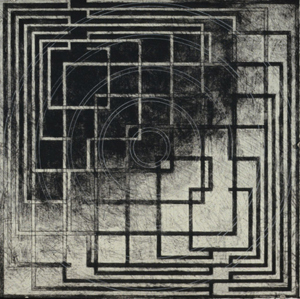 This print has both a positive and a negative image of a maze-like structure in it. The two images are juxtaposed against one another, and due to their size on the page, they intersect one another. The overlay of the circular image pulls the two maze structures together. Goldsleger created this print while working at Van Deb Editions, a master print workshop, in New York City.